Well, it's a new year, a fresh start, a blank slate, whatever you like to call it. For me, out with the old and in with the new this year. I've been in limbo for most of 2010, and it was a very frustrating and at times, discouraging year, so for me, it was necessary for me to start fresh. I've been purging my work and my supplies, getting rid of pearls and some beads, and odds and ends, and focusing on what I'm good at - stone setting and rings. The pendant above is a pendant that has 4 dyed turquoises, an amythest and 3 sapphires, all in sterling. I also tried something different. Rather than bezel-setting stones and pushing the silver band over the stones, I used a thicker bezel as a silver rim and expoyed the turquoises into the settings. I Iike how the silver bezel is more of a frame, so I will do that more with other stones I have. 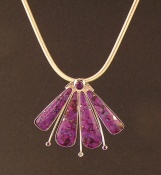 Right now, the purple pendant can be seen in the exhibit, Shades of Purple at the League of NH Craftsmen, 205 N. Main St, Concord, NH till March.